Our web badge is a great way to show your clients that you're a credible, 'professional professional', and that you take your business seriously. That can make all the difference. It's not a replacement for your policy documents but it is a quick and easy way to say: 'You can trust me, I'm covered'. So, if you'd like a badge of your own, simply fill in the short form below. We'll email some straightforward, step-by-step instructions on how to get you (or your webmaster) started. The badge is a doddle to set up and the whole thing shouldn’t take more than a few minutes. Select the badge you'd like, and your code will be displayed below. Transparent. Best avoided if your website has a black or dark-grey background. Solid green. Not great for websites with a green background. Solid dark-grey. Works well with lighter backgrounds. Solid white. Great for dark backgrounds. If you edit your own website, add the HTML at the appropriate point. If someone else does it for you, you'll need to copy it and send it to them. If you get stuck, please feel free to get in touch with our marketing executive Zoe. 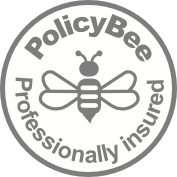 Call her on 0345 222 5378 or email zoe.darrah@policybee.co.uk. 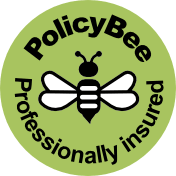 The web badge is available to customers of PolicyBee only. In the event a client of yours contacts us for more information about your insurance, we will not disclose any further information to them without your prior written permission. We reserve the right to withdraw your use of the web badge if either we or you cancel your policy. It is your responsibility to remove the web badge if your policy is cancelled. Please be aware that retaining the web badge without a valid policy in place does not mean that you're still insured and, if a claim is made against you, it will not be covered. 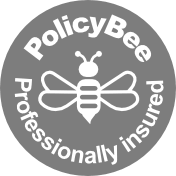 Please note that PolicyBee accepts no responsibility for any technical, aesthetic or usability issues with your website following installation of the badge. By installing the badge, you agree to our Terms and Conditions of use (as above). The badge is not intended to replace your policy documents and you should retain copies of your schedule and certificate(s) for reference.